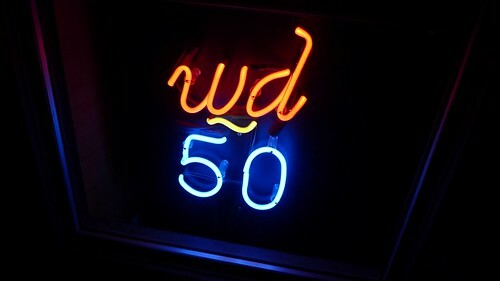 Our New York trip started with a bang at wd~50, Chef Wylie Dufresne’s Lower East Side playground of science and food. Dufresne’s reputation as the mad scientist of American cuisine is well deserved, but what matters at the end of the day is the food, and wd~50’s tasting menu, despite one small unexpected bump, simply rocked. 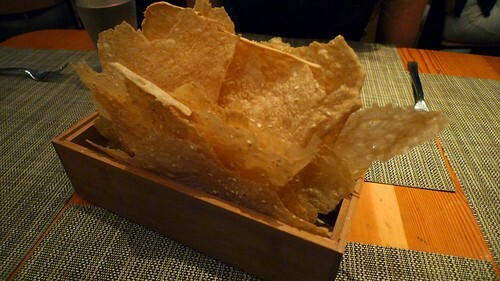 The meal started with basket of super-addictive, paper-thin sesame flatbread that was great sans any adornments. 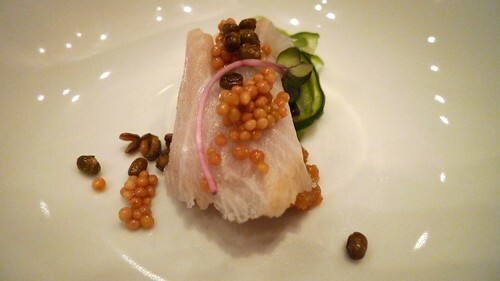 Our first course was the Cobia with mustard seed, mung bean and cucumber. This is probably the first time I’ve eaten a mung bean that wasn’t in mungo, a Filipino mung bean stew. This was a nice light way to start off the meal. 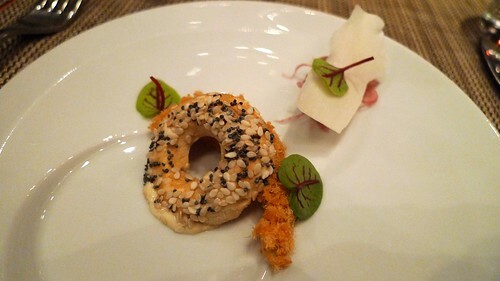 The next course was a take on the classic Everything Bagel, except in this dish, the bagel is actually ice cream made with everything bagels and is served with smoked salmon threads, pickled red onions and piece of crispy cream cheese. To understand the origins of this dish, watch Dufresne break it down at Metromix.com. 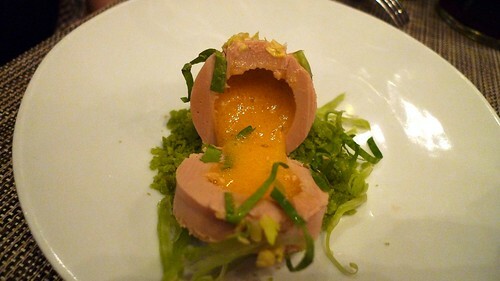 The third course was Foie Gras, a terrine of foie gras filled with passion fruit puree served with Chinese celery. This was the only real disappointment of the night. 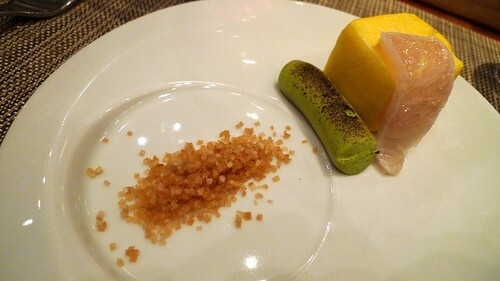 No one at our table enjoyed the combination of passion fruit and foie gras. As separate entities, they were fine, but if chocolate and peanut butter exemplifies “two great tastes that taste great together,” then this was the exact opposite. The Scrambled Egg Ravioli was next and served with charred avocado, kindai kampachi and fried little bits of potato. Breaking open the egg “ravioli” cube reveals a perfect, steamy, slightly runny scrambled egg, and combining all of these elements in one bite was a great combination of flavors and textures. 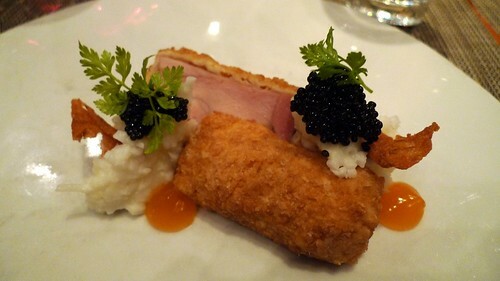 The table was split on the next course, Cold Fried Chicken with buttermilk ricotta, tabasco and caviar. My friend Teresa didn’t like the fried chicken because she thought the texture resembled processed meat, and I think she would have preferred it if it chicken was warm. She did agree with us on the other elements of the dish, especially the awesome Tabasco honey, which tied it all together. If there was one perfect dish of the evening, it was the Eggs Benedict. It’s not on the tasting menu, but we added it as a supplemental course. English muffin-crusted cubes are filled with an incredibly smooth and delicious Hollandaise sauce and fried. When you cut open the cubes, the Hollandaise spreads all over the plate. 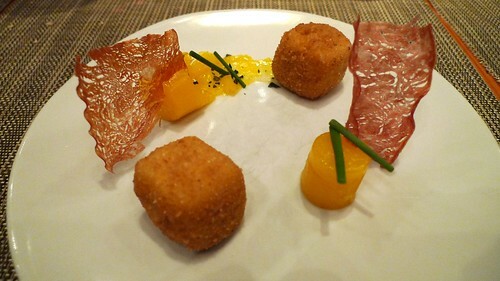 They were served with paper-thin Canadian Bacon strips and poached egg yolks. 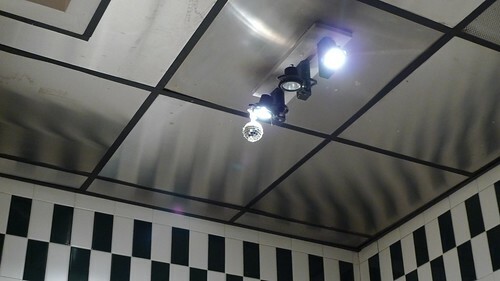 This was easily the best course of the night. The next dish was the beautifully plated Perch with kohirabi, “dirty grape” and cocoa nibs. 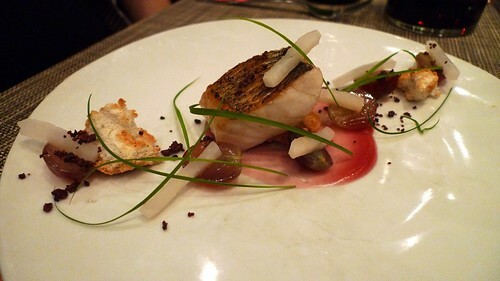 This wasn’t the most memorable dish, but I remember the fish being perfectly cooked and pairing nicely with the grapes and coco nibs. The thinly pounded duck leg with popcorn pudding, kalamansi, and lovage resembled a tuna dish we had a couple days later at Le Bernardin. 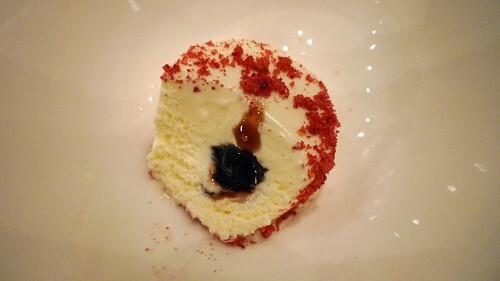 I always love seeing kalamansi represented at high-end restaurants, but the popcorn pudding was the talk of the table. Its flavor was weird but familiar, almost like the buttered-popcorn flavored Jelly Belly the first time you tasted it. 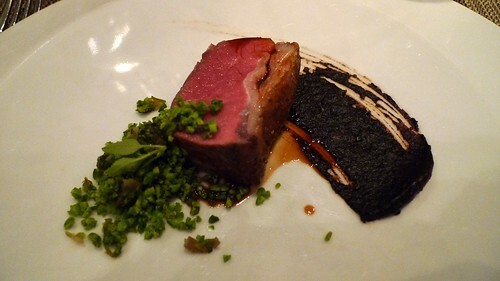 The last savory course was the Lamb Loin, a perfect piece of seared meat served with a black garlic romesco, pickled ramps, and dried soybeans. The lamb and romesco were great together, especially if you got bit of seared fat in the bite. The first dessert course was vanilla ice cream filled with aged balsamic vinegar reduction and coated with raspberry streusel. Aside from being really pretty, the marriage of vanilla ice cream and the sweet balsalmic was really nice while the streusel added a little texture. 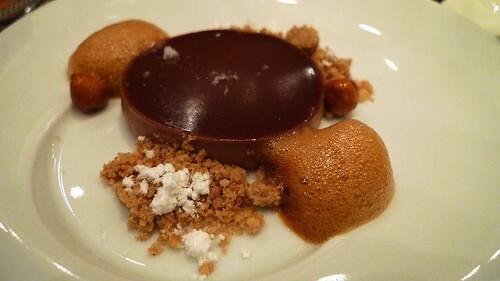 The chocolate hazelnut tart was perfect and our favorite dessert of the night. It was topped with a little salt and served with a chicory foam some coconut powder. 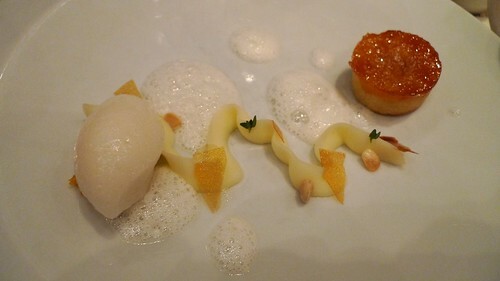 The last dessert was the caramelized brioche with apricot, buttercream and lemon-thyme sorbet. The brioche and the buttercream were really good, but I wasn’t really into the lemon-thyme sorbet. I also don’t think basil should be an ice cream or sorbet flavor so that might explain it. The meal doesn’t really end until you get the chocolate shortbread and cocoa packets. 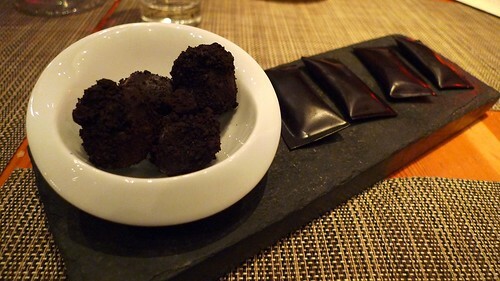 The shortbread was really the coating for a small piece of milk ice cream and was kind of like an Oreo bonbon. The cocoa packets look like ketchup packets, but they’re edible and filled with cocoa. I think the coolness factor outweighs the flavor factor with the packets, which was enough for me since we were all really full at the point. 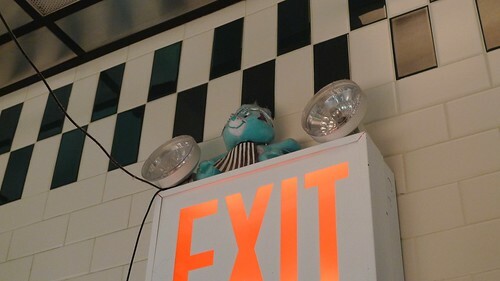 …and say goodbye to the Wylie Care Bear on your way out. 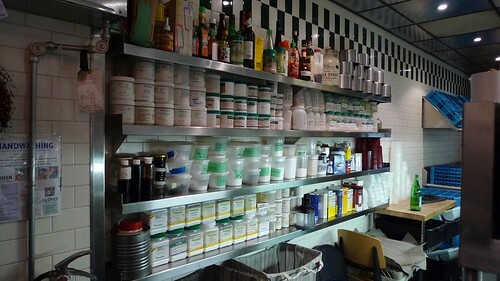 The cool thing about wd~50 is that unless they have other engagements, both Dufresne and head pastry chef Alex Stupak are working the line every night. This is the best way for chefs to ensure that their culinary vision is presented accurately, and it comes through loud and clear at wd~50. 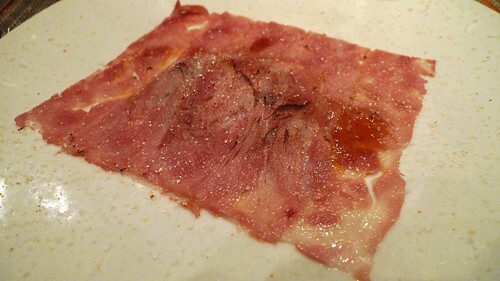 There are plenty of oddities on the wd~50 tasting menu, and it’s easy to see how their food might not be for everyone. For the most part, we had a lot of fun both eating and enjoying these dishes. Dying to try Wylie’s Eggs Benedict! I hope you guys had fun in New York. I’m glad you were able to enjoy some fine cuisine while you were there and I’m looking forward to reading all about it. Is eating out in NY really as expensive as they say? How does it compare to California? I am quite envious that you got to eat here as it is on my list of places to dine at at some point in time. I was very fortunate in that when I was flying back to Hawaii from Singapore earlier this year, I ran into Wylie on the plane! We were both transiting in Tokyo (Narita)!